Your dad, Stephen, was a pastor, social worker and vibrant part of his community. When did you notice that something wasn’t right with him? Dad was a prayer guy. At our big family Christmas gathering, he always said this elaborate prayer that would take him a week to prepare. At the end he’d say, “Turn to your relatives to the left and the right and hug them and tell them why you love them.” Seven years ago when he gave his prayer, he forgot his siblings’ names. For decades, he had done this prayer. It was a big deal for the entire Lui clan that he couldn’t do it. My aunt took me aside and said, “I think your dad should see a doctor.” He’d always been very open to understanding sickness. And I think something about him was like “I’m sick. Let me go and try to fix this.” He went in and got diagnosed, and he never was down about it. You, along with your three siblings and your mom, are part of your dad’s caregiving team. They all live in California, and you fly in from New York. Besides visiting every few weeks, what are some of the ways you keep in contact? We created a Google doc and list all of his doctors’ appointments, test results, medicines, activities, visitors, etc. It’s really helpful to have everything in one place so we don’t have to constantly call to ask for updates. What advice do you have for long-distance caregivers who get distressed if they can’t visit their loved ones? Just own that it’s hard. Accept that you’re not perfect. Talk to someone about it. I think the biggest stress is, Am I making the right decision? If I stick with my job or don’t? If I call in sick? If I don’t see my family or my friends or my significant other? What is the right thing? And I think the struggle is thinking, I will never make the right decision. I’m in a no-win situation. But actually you are in an always-win decision if you are keeping your loved one in mind and what they would want you to do. Check out the Alzheimer’s Association website, alz.org, as well for great info and resources for caregivers. 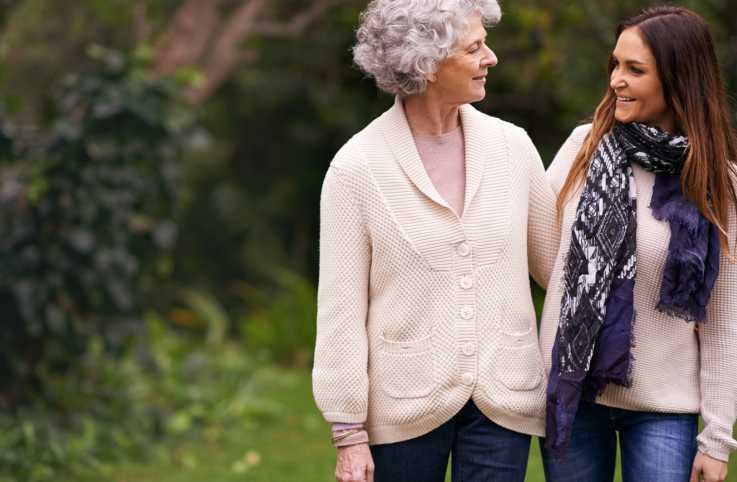 You’ve found that caregiving doesn’t have to be serious all the time. How has humor helped you and your family? Finding some humor in all of this is very human and very necessary and doesn’t take away the difficulty, the sadness. When he was diagnosed, Dad was active and able to take care of himself. Now, seven years later, he’s living in a care facility. He’s bedridden and can’t feed himself. We are dealing with tough stuff. When he was still living at home and I started having to change him and clean him, he loved to run around the house naked. Sometimes he’d go, “Oh, I have to poop.” Boy, cleaning up his poop and helping with diapers—that freaked me out. I knew this was a benchmark when Dad couldn’t take care of himself. I started to joke about it. And I hope it helped my siblings. We would use the poop emoji in our group texts when we took turns watching him. “Oh, he pooped today.” Then we would use one, two, three or four poop emojis. “He did a three. He did a two. He did a one.” It was really tough for my one brother who’s super clean and doesn’t like to talk about that stuff. But even he started to joke along with us. You had to start shaving your father as well. That must have been difficult. Dad had a morning ritual. Get up, eat his oats and milk and raisins. And shave. There came a point where he didn’t know how to do it anymore. I took out his electric razor. When I turned it on, he smiled. He liked the feel of it on his skin. And he squealed—whoo and yeah—like a kid. Dad had taught me how to shave, and I thought it was very symbolic of that shift of roles we go through, helping parents with Alzheimer’s. It was not only that I was shaving him but that it meant so much to him. I held his hand throughout the entire process. It was a moment of connection. How has your faith helped you as caregiver? It’s definitely been a source of strength and comfort for me. We’re pastor’s kids. My eldest sibling texted in our group thread that he had just read John, chapter one, to Dad. We’re each reading a chapter when we visit. We pick up where the last sibling or Mom left off. For Dad, sound is definitely key. He loves the Lord and the Bible, and he can also hear and recognize our voices. He can’t talk anymore, but he does interact. When he’s keyed in, his eyes will look at you. He’ll smile. Can you talk more about the importance of voice, sounds and music for your dad? We can speak into an amplifier or have it play sounds. The connected headphones act as hearing aids. My dad was always hard of hearing. With Alzheimer’s, his senses need all the help they can get. You’ve said that watching the progression of Alzheimer’s was like watching your dad die a bit in front of you. And then being born again. Can you explain? Dad was a real stressed-out guy when he was middle-aged. He took home all the problems of people he was trying to help as a social worker and a pastor. I think he was born again in that, despite this disease being part of his new life, he hasn’t gone back to worrying. He’s so positive. He’s the most wonderful patient. All the nurses love him because he would kiss everybody on the hand and smile and laugh with them. Life is a stack of pancakes, and Alzheimer’s takes the top pancakes little by little until you’re left with none. Even if this disease has stripped away all his memories like pancakes, well, look at him. Dad is a good, faithful man.